Everyone!…because you’ve found the awesome DallasVegan.com blog! Ok, well, there’s actually just one winner of the Coconut Lime Verbena candle from Signature Scentsations from our Friday giveaway. Congratulations to Lauren Dixon – she started following us on Twitter and was picked by the randomizer at random.org. We will follow-up with details on getting you your candle (unless I break-down and start using it first…!). In other news, the DallasVegan team met this past weekend over some Cheladas and food at Mi Cocina for some people-watching and discussion about DallasVegan.com. 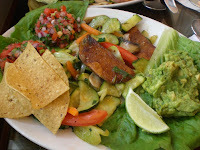 Did you know that Mi Cocina has a vegan (almost) menu item available? Order the “Latin Stir-fry” without the rice (try double refried beans, or double pico like Eddie G opted for), and you have a great meal without having to venture too far off the menu. “A Dallas Vegan in ?? ?” – another member of the DallasVegan team is going on vacation. Stay tuned for more perspectives from another interesting location. Like Indian food? Stay tuned for a review from Drew. Eddie G is going wild for hot-dogs at a popular local restaurant. Ok, the M Crowd is too confusing. I love the chips and salsa at Mi Cocina. And I love the Latin Stir Fry - it's my go to choice (and it will feed you at least twice). I know Mi Cocina uses chicken stock in the rice (and I believe their sister restaurant Taco Diner does as well). That said, I've never heard a clear answer on the vegetarian beans. Some say yes, some say no. I almost always just get a side salad instead (ask for no cheese). And not to rant about veggie Tex-Mex, but why oh why do they give you 2 lbs of veggies? I swear it's more food than if you order steak fajitas. Do they think that by skipping the meat I need twice as much veggie? I normally wouldn't complain, but Mi Cocina is oh so proud of their Latin Stir Fry and a few margaritas ($$). Brandi - yes, that's what they tell us. No lard in the refried beans, they just use vegetable oil. BC - interesting comment about Sol's. I've actually had the experience there where the servers never seemed to know whether or not their items were vegan - which is why I stopped going. I used to love that place. Definitely a great value. I guess I need to check them out again. Lauren - sometimes it pays to be lucky!